Investors jumped back into stocks Tuesday as worries about a military conflict between Russia and Ukraine abated. 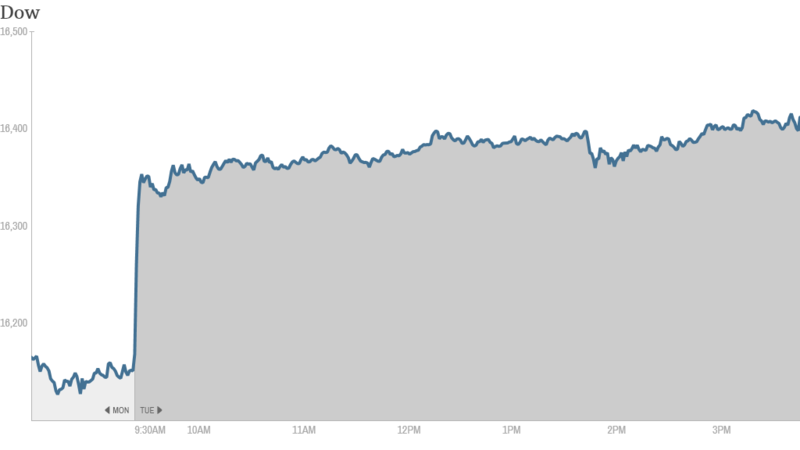 The Dow Jones industrial average gained 228 points, or 1.4%. It was the biggest gain of the year for the Dow. The S&P 500 rose to a new all-time high while the Nasdaq gained nearly 1.8%. And all but three of the 30 companies in the CNNMoney Tech 30 Index were higher. Stocks plunged Monday as Russian troops moved into the strategically important Crimea Peninsula in Ukraine, raising the threat of an outright military conflict between the two countries. But tensions eased Tuesday after President Vladimir Putin said Russia has no plans to take over the region, though he stressed that Moscow reserves the right to use military force to protect Russian speakers in Ukraine. While investors welcomed Putin's comments, the situation in Ukraine remains highly volatile. Both President Obama and Secretary of State Kerry criticized Russia's actions Tuesday. The White House is considering sanctions, while U.S. and European leaders have pledged to support the fledgling government in Kiev. Meanwhile, investors bailed out of the safe haven assets they rushed into Monday. Gold prices fell more than 1%, while the yield on 10-year U.S. Treasury bonds rose to 2.69% from 2.60% late Monday. Bond rates increase as prices fall. The CNNMoney Fear & Greed index surged Tuesday and was back in 'Greed' territory after falling to the 'Neutral' level on Monday. One trader on StockTwits was surprised the index was not signaling even more greed in the market. "$IWM $SPY $QQQ $DIA Fear&Greed index is 72 now. Would have thought it would be higher given this move today," said Andrew_C. Traders were particularly impressed by the demand for companies with smaller market values and technology firms, which are generally considered more risky investments. "$QQQ 57 new s&p highs!!! Not even WWIII can stop this rally!!!!" said PGA4. The PowerShares QQQ Trust (QQQ), an ETF that mimics the Nasdaq 100, gained more than 1%, but remains well below the tech-bubble peak of 2000. The iShares Russell 2000 index (IWM) ETF, which tracks small company stocks, rose to an all-time high. "It's bullish that the small caps have broken out to new highs. Russell 2000 up 4% YTD. $IWM," said TraceyRyniec. But not all traders were so quick to disregard the possibility of more tension in Ukraine. "$IWM if it was all teddy bears, ponies and butterflies, the vix would be lower than this. Putin's not done yet..." said WhatTheChuck. Russia's main stock market index soared more than 4% after suffering an 11% fall Monday. Europe's leading markets also bounced back. Asian stock markets ended sharply higher as well. On the economic front, President Obama released his fiscal year 2015 budget proposal Tuesday. The $4 trillion proposal, which is not expected to pass Congress, includes more generous tax breaks for working families while scaling back breaks for the rich. In corporate news, RadioShack (RSH) shares tumbled more than 20% after the electronics retailer said that it is closing about 1,100 stores, or about 20% of its total, amid plunging same-store sales. 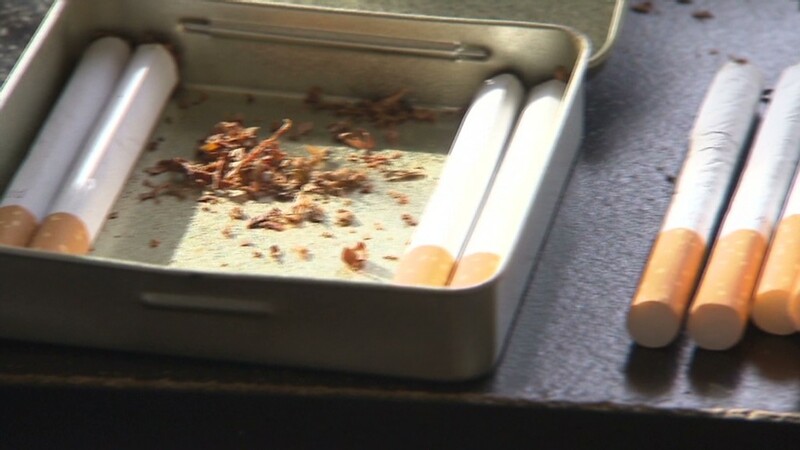 Shares of tobacco company Lorillard (LO)extended Monday's gains amid ongoing speculation that it could be bought by larger rival Reynolds American (RAI). Apple (AAPL) shares edged higher after the iPhone maker said Chief Financial Officer Peter Oppenheimer would retire. Gun maker Smith & Wesson (SWHC) reported earnings after the close that topped forecasts. Shares rose more than 7% in extended trading. The stock fell last week after rival Sturm Ruger (RGR) reported results that disappointed investors.